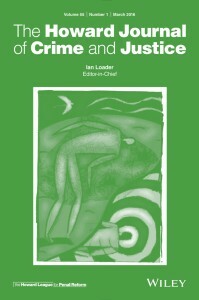 The Howard League for Penal Reform’s journal was relaunched in 2016 with a new title, The Howard Journal of Crime and Justice, and a new editor, Professor Ian Loader from the University of Oxford. The Howard Journal of Crime and Justice is an international peer-reviewed journal committed to publishing high quality theory, research and debate on all aspects of the relationship between crime and justice across the globe. It is a leading forum for conversation between academic theory and research and the cultures, policies and practices of the range of institutions concerned with harm, security and justice. The Journal is proud to be associated with, but maintains full editorial independence from, the Howard League for Penal Reform which is the oldest penal reform charity in the world and has consultative status with both the United Nations and the Council of Europe. The Journal publishes material of a high academic standard but written, so far as possible, in a non-technical style, not unnecessarily burdened with statistical tables and specialist vocabulary. Each issue of the Journal includes a book review section. In addition to published articles, the Editorial Board is open to other formats for fostering dialogue on crime and justice issues, such as special issues, themed debate sections, and interviews with academics and practitioners. The Journal especially welcomes contributions from early career scholars and from authors in the Global South. All contributions are peer-reviewed by one of the Editors and at least two members of the Editorial Board. The Board aims to have submissions reviewed in a timely manner and typically the time taken from submission to publication is less than 12 months. The Journal also utilises an ‘early view’ online publication system with three months being the average time taken from receipt for production to publication on early view. Authors should note that the Editorial Board is committed to a policy of anti-racism and anti-sexism in respect of the terminology used in articles in the Journal. The Howard Journal of Crime and Justice is published by Wiley Blackwell. Please visit the journal website for full details about how to submit papers for review. Members of the Howard League can access the journal online. If you are a member, email info@howardleague.org to register and get your online access details. Hard copies of the journal are available to full rate members for free. If you are not a member, you can join online here. We are an independent charity and are funded by donations and membership subscriptions. Please help us secure our future by joining today and adding your voice to our movement for change. Alison Liebling, Ben Laws, Elinor Lieber, Katherine Auty, Bethany E. Schmidt, Ben Crewe, Judith Gardom, Deborah Kant, Martha Morey all from the University of Cambridge. There is both hope and frustration in this article. A recent research exercise in a prison found it to be inspirational in its ethos, relationships and mission. Prisoners talked passionately about their experiences in it and its impact on their personal development. But prisoners received very little resettlement support and things sometimes went wrong as soon as they were released, not because of any ‘moral failings’ on their part, but because they could not even navigate the journey ‘home’. It looked like everything we know cumulatively about ‘better prisons’, but its prisoners were failed as they transitioned out. More ‘tragic imagination’ is required in penal policy. Following the publication of this article the lead author, Professor Alison Liebling, agreed to discuss her motivations for conducting the research, the findings and the ideas underpinning her approach. This conversation with the Howard Journal of Crime and Justice’s Editor-in-Chief, Professor Ian Loader and the Governor of HMP Wayland, Sonja Walsh. Watch the video of the discussion below. A new feature introduced by the Howard Journal. Find out more about articles published in the Howard Journal by watching our video abstracts. This article argues that criminology has inadequately theorised militarism as it relates to the prison system, this agenda-setting article introduces the ‘prison-military complex’ as a means to initiate examination of militarism in relation to institutions and practices of incarceration. It focuses on a key knowledge gap vis-à-vis the role of ex-military personnel employed as prison staff; and poses key questions about the ways in which military staff and military methods are being directly targeted as a means to reform a prison service reeling from unprecedented levels of violence, self-harm, riots, and escapes. Encouraging criminologists to think beyond stereotypical ideas about the military, the article revolves around a multiscalar articulation of the prison-military complex, discussed here as it relates to reform of the prison system as a whole; the rehabilitation of offenders; and individuals’ ex-military transitions to civilian life. The article is currently available on the Howard Journal’s website and can be found here. Can – and should – lawyers be considered ‘appropriate’ appropriate adults? This paper adds to the debate on vulnerable suspects by bringing together research on appropriate adults and criminal defence lawyers. The Police and Criminal Evidence Act (PACE) 1984 forbids all lawyers from acting as appropriate adults. The courts, in very limited case law, have taken a different approach, leaving a space in which lawyers might be considered suitable to fill the gap left by an appropriate adult’s absence. Empirical data exploring the views of custody officers on the appropriate adult and its use supports this account. Fieldwork with defence lawyers is then explored to highlight how lawyers might have some of the suitable characteristics of the appropriate adult but could not realistically perform such duties in practice (or conceptually). This paper illustrates that lawyers are ill-equipped to deal with a client’s vulnerability and therefore argues that they should never be viewed as an ‘appropriate adult replacement’. Over the past two decades, policymakers have been encouraged to develop evidence‐based policies in collaboration with experts. Drug policy is unique since it has an established inbuilt mechanism for soliciting expertise via the Advisory Council for the Misuse of Drugs (ACMD). Increasingly alternative mechanisms have been used. Based upon detailed analysis of two case studies of drug policymaking using alternative methods to solicit expertise, we argue that the framing of the policy problem, the mechanisms used to involve experts and the type of evidence actively sought, have continued to marginalise the involvement of the drug user in policymaking. Families represent a form of social capital that can influence effective reintegration depending on the strength of the bond, and the nature of the relationship. An innovative training programme delivered at HMP Kirkham was designed to mobilise the strengths of prisoners, in the period prior to their release, by engaging family members as bridges to community resources and by a shared planning process designed to build stronger bonds between prisoners and their families. The conceptual framework for the Kirkham Family Connectors (KFC) project is based on the principles of Asset Based Community Development (ABCD) and Assertive Linkage (assisting individuals in engaging with such assets). The project aimed to build prisoner resettlement capital by identifying what each prisoner’s skills and strengths were, what enthused and engaged them, and to create partnerships with family members to establish accessible pathways to related resources in the communities they would be returning to on their release. Evaluation data shows that the programme generated hope and a sense of partnership among participants and key lessons for a strengths-based intervention to support the prison-community transition. All three of the participating groups – staff, prisoners and families – reported positive engagement and an emerging sense of hope, and group cohesion through shared goals. There is considerable scope for both peer and probation staff delivery of the programme in the future, and for extending the scale and the scope of the project. This article is currently free to access here. Maria Deleon Marquez discusses the idea of procedural justice in prison. The article discusses how prison employees’ use of respectful language improves their interactions with the inmates. However, some interviewees describe harsh language and threats used against the inmates. We identify this as procedural injustice where they force the inmates to comply by threatening them with harsh punishment. The choice to use respectful behavior is dependent on whether or not inmates question their authority. Training needs to focus on helping prison workers present themselves as legitimate authority figures rather than authoritarians. The article is currently free to access here. This special issue seeks to contribute to the understanding and explanation of penal change by exploring and illustrating what it means to examine penal policymaking through a range of interpretive lenses and via a number of specific case studies. Currently there is a renewed interest in the exploration of penal change and the political dynamics that drive, underpin, and relate to, developments in penal policy and practice. This latest wave of scholarship is situated within, and owes great intellectual debts to, a rich extant literature whose foundations, due to the interdisciplinary nature of penological scholarship, span law, sociology, philosophy, social theory, political science, and beyond. Underpinning all of the articles in this special issue is a motivation elucidated recently by Barker and Miller (2017), who have emphasised the value of case study research in examining the complex dynamics between State power and penal order. The articles contained in this special issue demonstrate the value of such approaches and the potential for valuable dialogue between studies that analyse different ‘levels’ of policymaking and through different theoretical lenses in order better to understand penal change. This special issue draws issues ranging from the English riots of 2011, through sentencing and prison policy to prostitution and drug laws to examine the process of penal policy making. Harry Annison’s article Politics and Penal Change: Towards an Interpretive Political Analysis of Penal Policy Making is currently free to access. John Pratt (2008) put Nordic penal exceptionalism firmly on the criminological agenda describing penal practice in Norway, Sweden and Finland. This was then placed in sharp contrast with Anglophone penal excess in Pratt and Eriksson’s subsequent book (2011). Pratt travelled to the Nordic countries to establish why penal practice was restrained, positive and generally form an exception to penal trends worldwide. Ironically, the key ingredient of exceptionalism is in fact its semantic opposite, normalisation. It refers to efforts to maintain in prison life as state of normality, for prison life to be as ‘normal’ as possible in order to facilitate Nordic prisons’ main objective of preparing prisoners for a return to society. The common phrase used is that Nordic prisons are places of punishment but not places for punishment: the deprivation of liberty is in the fact the punishment whilst the stay in prison should facilitate a prisoner’s betterment or personal growth. Using Norway as a comparator, this article explores the Icelandic approach to prisons to see if it has something fresh to offer. This article is based on qualitative data from interviews with 46 welfare and justice professionals to examine the criminalisation of children who go missing from care. Everyone interviewed had direct experience of children in residential care either through the direct provision of care services, the development of Out‐Of‐Home‐Care policy initiatives or through their role as law enforcement, legal or justice personnel. The research found that agency practices, which were designed to protect children actually serve to conflate going missing with criminality and that this accelerates children’s involvement in the justice system and ultimately endangers children’s safety. Emma Colvin and Kath McFarlane explain more about their research. Other articles from previous issues of the journal may also be free to access, so it’s worth taking a look.